it’s been a while since we whipped up a salad. but seeing that it’s fiesta friday, we feel the time is right for a savory summer salad. 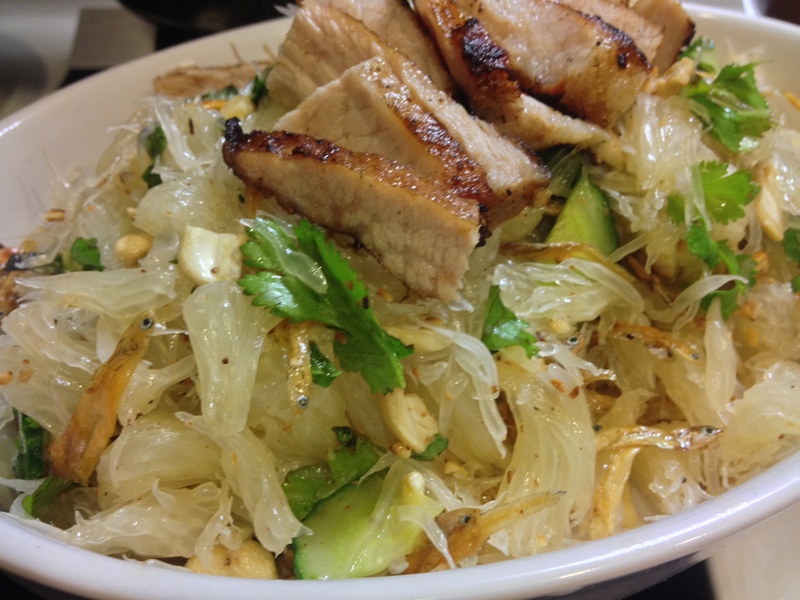 this dish was inspired by a recent visit to an awesome thai restaurant in tuen mun. we decided to replicate that refreshing summer salad in our kitchen, with our own added variation. we topped it with pork cheek, but shrimp or chicken breast works too. also, you can substitute cashews with peanuts, and dried fish with dried shrimp. 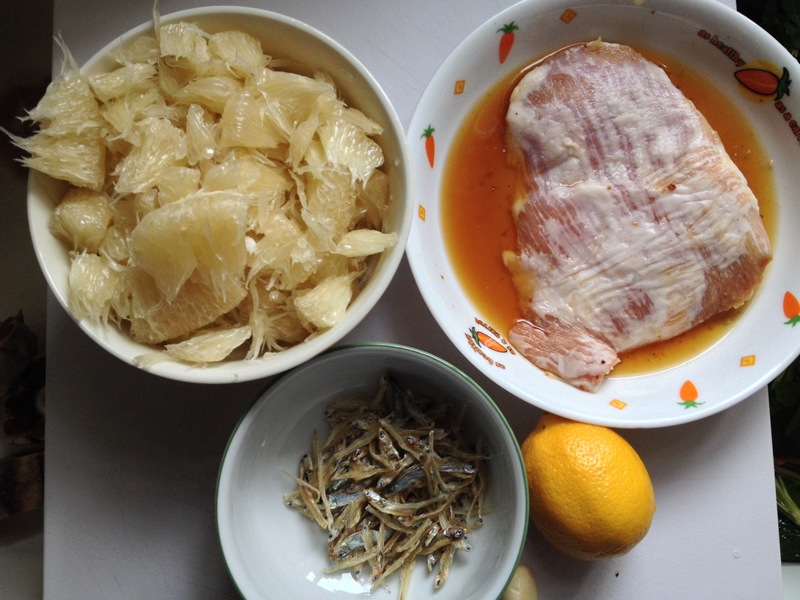 to save time and energy from dismembering a whole pomelo, buy the peeled ones at the market. Ooh, that sounds amazing! I’ll have to try that! I may have to substitute grapefruit and another cut of pork, as pomelo and pork cheeks are hard to find here, but I love the general idea. yeah definitely play around with the ingredients you like. try the asian markets for pomelo, maybe a thai market. but pork cheek is a rare cut to find. I definitely think that pork cheek is underrated and putting it in a salad is a nice way to balance out the richness. I bet it was yummy 🙂 definitely bookmarking – hopefully I can find pork cheek. Hope you can find pork cheek too. It’s definitely a delicious salad! you’re absolutely right! it’s definitely a great combo. I love pomelo! And this salad looks so refreshing, great flavours in the dressing too. The FF crowd is going to love this, thank you for bringing it to the party!! thank you saucy gander! have a great weekend! I like the balance of the veggies with the pork. Looks very interesting! yum! happy FF! thank you lisa! happy FF!